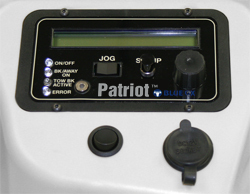 The Patriot from Blue Ox gives you the comfort needed when you are braking your tow vehicle. Not only is it convenient and easy to store, but it also proportionally applies the brakes smoothly while you’re slowing down to a stop, instead of suddenly jolting your tow vehicle causing costly damage to your brakes. The Patriot even works with Hybrids! All Blue Ox braking systems come with a one year warranty. The Patriot works for your motorhome and tow car by safely bringing it to a smooth stop with proportional braking. Monitor all brake functions or manually apply brakes from the comfort of the driver’s seat through a wireless remote control that continuously communicates with the braking system. Built in battery ensures power is always available to the brake. By using an electric cylinder there are no air pumps, storage tanks or hoses; therefore there is no chance for leaking and greatly reduces power required. 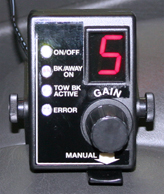 On the brake itself, there is an easy-to-read LED display, complete with one set up button, a break away plugin, manual adjustment for sensitivity, on/off switch and an auxillary 12-volt connection. In-coach controller complete with a manual brake lever, easy-to-read LED display and gain adjustment.